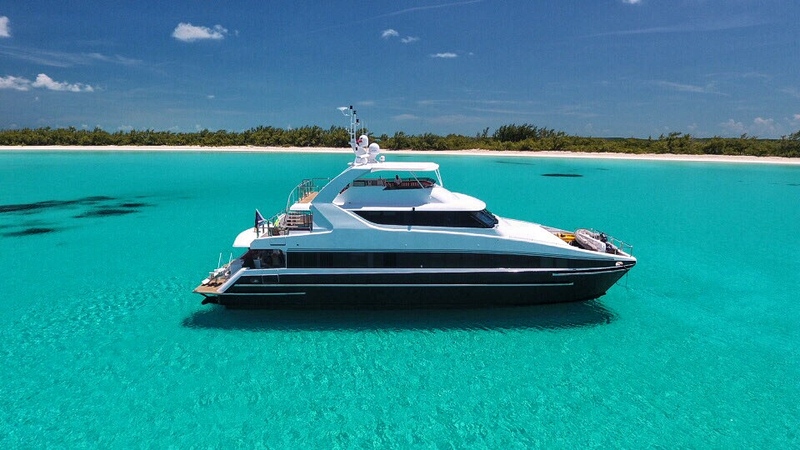 If one were to dream up the perfect yacht for the Bahamas, it might very well be “Pegasus IX”, a 2004 90′ Sabre Powercat that just hit the market at $2.995 million. Propelled by two MTU 16V2000 engines, she tops out at 33 knots – and that kind of speed means that “all options are on the table” as far as the day’s cruising plans go. Plus, Pegasus IX’s draft is barely four feet, so she can explore the Bahamian shallows in ways that would be flat-out reckless on most other tri-deck yachts. The master stateroom on this powercat is HUGE, clocking in at a whopping 600+ square feet. One entire wall is comprised of a series of windows, providing the kind of “Travel + Leisure” views that one needs to see to believe. Keep in mind, though, that Pegasus IX is strictly a boat for VIPs, because the rest of the guest quarters are comprised of, well, two VIP cabins, and they’re both on the main deck, along with the Master. How ready is Pegasus IX for her next owner? Well it’s tempting to say that she was “born ready”, but that wouldn’t make any sense. Instead we’ll say that she’s been beautifully-maintained and underwent a transformative multi-million dollar refit in 2015. So, yes, she’s extremely ready for her next owner and the countless hours of blissful cruising that surely await. Could this get any better? You bet it could. This yacht was built to ABS class, has a VERY strong charter record, and can be operated by two crew members. See? We just gave you three more solid reasons to see Pegasus IX in Nassau, where she’s available for viewing.